Abstract. The terrestrial biosphere regulates climate through carbon, water, and energy exchanges with the atmosphere. Land-surface models estimate plant transpiration, which is actively regulated by stomatal pores, and provide projections essential for understanding Earth's carbon and water resources. Empirical evidence from 204 species suggests that significant amounts of water are lost through leaves at night, though land-surface models typically reduce stomatal conductance to nearly zero at night. Here, we test the sensitivity of carbon and water budgets in a global land-surface model, the Community Land Model (CLM) version 4.5, to three different methods of incorporating observed nighttime stomatal conductance values. We find that our modifications increase transpiration by up to 5% globally, reduce modeled available soil moisture by up to 50% in semi-arid regions, and increase the importance of the land surface in modulating energy fluxes. Carbon gain declines by up to ∼ 4% globally and > 25% in semi-arid regions. We advocate for realistic constraints of minimum stomatal conductance in future climate simulations, and widespread field observations to improve parameterizations. How to cite: Lombardozzi, D. L., Zeppel, M. J. 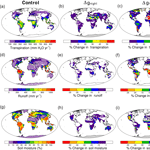 B., Fisher, R. A., and Tawfik, A.: Representing nighttime and minimum conductance in CLM4.5: global hydrology and carbon sensitivity analysis using observational constraints, Geosci. Model Dev., 10, 321-331, https://doi.org/10.5194/gmd-10-321-2017, 2017. Earth's terrestrial surface influences climate by exchanging carbon and water with the atmosphere through stomatal pores. However, most land-surface models, used to predict global carbon and water fluxes, estimate that water lost through stomata is less than what observations show. 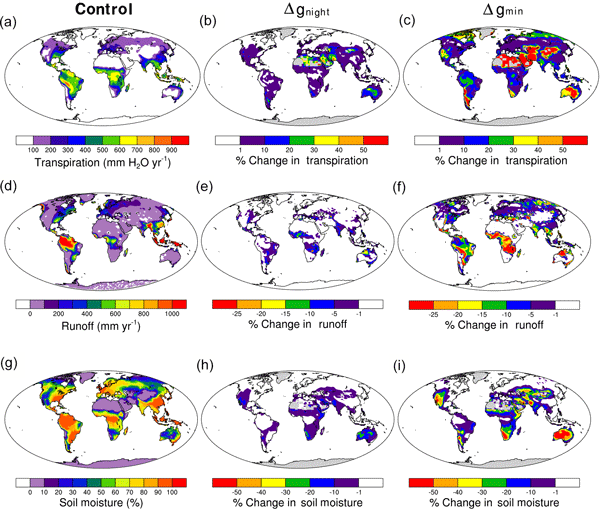 In this study, we integrate plant water loss data from 204 species into a global land surface model, finding that global estimates of plant water loss increase, soil moisture decreases, and carbon gain also decreases.